Ram claims the original World War II army truck-derived Power Wagon was the first 4×4 pickup and that that truck’s successor remains the most capable off-road pickup on the market—fans of the 1913-1928 Jeffery Quad might debate that former claim, but we more or less validated Ram’s capability boast on a run across the Newfoundland Labrador wilderness. As the Ram 2500 line gets upgraded for 2019, most of those upgrades get applied to the Power Wagon while it carries over most of its previous unique features. Another major improvement is a new 360-degree camera option, which provides a top-down view of the entire truck while forward cameras provide a close-up view to help place the tires when rock crawling. The standard 6.4-liter gas V-8 engine gets the MDS cylinder-deactivation system that launched on the half-ton version, along with all the noise and vibration countermeasures that allow these trucks to operate in four-cylinder mode more often—new engine mounts, vibration-canceling frame shakers, and active noise cancellation through the stereo plus all new exhaust hanging brackets that transfer less noise and vibration. Heavy-duty trucks don’t get an EPA rating, but internal testing suggests customers should see an 8-10 percent improvement in fuel economy. The engine is now teamed with an 8HP75R strengthened version of the eight-speed that has been powering the 1500 series trucks. The much shorter first gear ratio in this transmission reportedly improves the Power Wagon’s low-range crawl ratio from 35:1 to an impressive 51:1. Ram Trucks revealed both of the Heavy Duty models for the first time at the 2017 Chicago Auto Show. Based on the Sport appearance package, the Night adds blacked-out features, including wheels, grille surround and badging, to deliver an eye-catching twist on the performance-enthusiast package. If you’re looking for a way to stand out from the crowd – these Heavy Duty Night models will do just that. 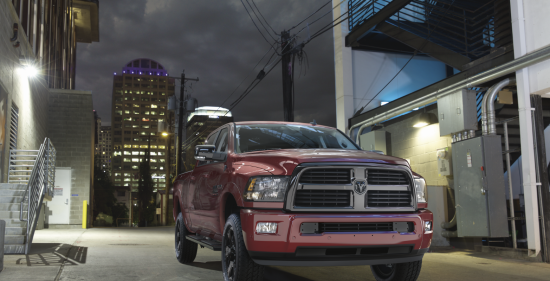 The Night package is available on Ram 2500 and 3500 (single-rear-wheel models only) in Crew Cab configurations, 4×2 or 4×4, and any available powertrain combination (5.7L HEMI® V8, 6.4L HEMI V8 or 6.7L Cummins® I-6). Ram 2500 and 3500 HD Night models are available in Bright Silver Metallic, Bright White, Brilliant Black Crystal, Delmonico Red Pearl and Granite Crystal Metallic. Production of the 2017 Ram HD Night models began early February 2017. Ram Heavy Duty Night pricing starts at $45,520 MSRP, plus $1,320 destination. Brian Williams caught this 2017 2500 Ram Power Wagon Laramie while it was being tested in high altitudes in the Rockies. He wrote that it’s only missing the legacy “Macho Power Wagon” graphics and blacked out bits. The brawny, off-road-oriented Power Wagon, revamped for 2017, will gain a more luxurious version for those who need the muscle but also want the pampering of the wood and leather-lined high-end trim offered on other Ram pick-ups. The Laramie will get more brightwork as befitting of this top-spec Ram, with a new take on the Power Wagon’s Rebel-derived grille – a sort-of chromed mesh insert replaces black plastic. Chromed wheels are now wrapped in the chunky off-road tires, too. Inside, the Power Wagon should get the typical Laramie treatment, which means upgraded leather with thick stitching and wood-like trim. Expect to see the Laramie Power Wagon later this year. A reliable source oh2o provided a list of what will be changing for the 2016 model year in the Ram 2500 and Ram 3500 pickup trucks. Production of the 2016 model year pickups begins on July 20, 2015, and will include the new Limited, with the same controversial grille and tailgate appearance as the Ram 1500 Limited (shown below). Available as a crew cab or mega cab only, it will have unique wheels (except on double-rear-wheel setups, or “duallies,” which will carry over the old wheels). The interior is all-black and similar to that of Ram 1500 Laramie Limited; bumpers are painted, with optional chrome. The photo above shows a 2016 Ram 2500 Laramie Limited, as shown at the Chicago Auto Show. Other models are likely to have a grille similar to those of the 2015 trucks. All 2016 “heavy duty” Ram pickup trucks will have a new center console layout; Longhorn and Limited will also use a new, wooden tambour (sliding console) door. New 18 inch aluminum wheels will be used on Big Horn, Lone Star, and Outdoorsman, with new pickup box lighting (LED lights on each side at the rear) on Longhorn and Limited, optional on some other models, and included with Luxury Group and Rambox. Engines appear to remain the same, except for a new compressed natural gas (CNG) option on Crew Cab / long-bed in rear wheel drive, and regular cab models in rear and four wheel drive. Ram continues to have the only factory-upfitted CNG option, not using an aftermarket solution. The base radio on Tradesman remains the same but will be renamed from RA1 to Radio 3.0 AM/FM. Some models will get optional front and rear parking assistance (standard on Laramie and higher trimlines). phablet holderThe rear camera will be able to toggle between a cargo view and the backup camera; the cargo view camera will be packaged in the Convenience Group with rain-sensing wipers and automatic-beam headlamps. Finally, the usual paint changes are going to be made, with red pearl replacing deep cherry red, “Luxury Brown” replacing “Western brown,” and a new pearl white option on higher-level trucks starting with September production. It normally takes a month or two for trucks to reach dealers after production begins. The 2015 Ram pickup trucks now have new tow ratings that were certified under the stricter demanding SAE J2807 regulation. Impressively, not a single model sees its ratings decline under the new certification process — and some even see ratings increase slightly. All versions of the 2015 Ram 1500, 2500 HD, and 3500 HD will henceforth have towing figures that meet the stricter tow ratings. For light-duty pickup trucks, the 2015 Ram 1500 has SAE J2807 tow ratings as follows. Models with the 3.0-liter turbodiesel V-6 engine and eight-speed automatic transmission can tow up to 9200 pounds, trucks with the 3.6-liter gasoline V-6 can manage up to 7600 pounds, and Ram 1500 models equipped with the 5.7-liter V-8 engine can tow as much as 10,650 pounds. For the 3.6-liter V-6, that’s an increase of 150 pounds compared to 2014 ratings, while the 5.7-liter V-8 see its maximum rating rise 200 pounds. The 2015 Ram 2500 and 3500 are also subject to the new SAE J2807 ratings. With a 6.4-liter gasoline V-8, the 2500’s max tow rating is 16,300 pounds, or 17,970 pounds with the 6.7-liter Cummins diesel inline-six. Those figures are unchanged from last year. As for the 2015 Ram 3500, trucks with the 6.4-liter engine can tow as much as 16,420 pounds, while models with the 6.7-liter mill boast maximum tow ratings of 30,000 pounds. Earlier this year, General Motors, Ford, and Ram all confirmed plans to adopt the SAE J2807 ratings. The new certification process is more rigorous and is designed to test the real-world towing abilities and safety of the trucks. It includes tests for the vehicles’ acceleration, braking, and cooling-system performance, as well as things like understeer and double-lane-change handling tests. GM already confirmed the 2015 Chevrolet Silverado 1500’s ratings under the SAE J2807 standards. The pickup truck saw some of its models’ ratings decline by 300-400 pounds, depending on engine and configuration, when switching to the new rules. Ram grille change no big deal? Opinion/Analysis: it seems to me that the uproar over the new grilles on the Ram Laramie and Rebel is a classic case of making a mountain out of a molehill: a task made more difficult because it starts without a molehill. 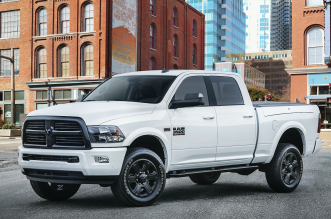 Automotive News’ Larry Vellequette and Allpar’s Daniel Bennet have written about the change, saying it’s a sign that the Ram brand is suffering from an identity crisis. Their argument is that Ram trying to further distance itself from Dodge by moving away from the crosshair grille and the ram’s head badge. The more likely reason for the change is to let buyers know this is a new Ram pickup [as alluded to by designer Greg Howell]. How long has the Ram pickup used the same general grille design with only very small changes that most consumers won’t even notice? Since Ram became a separate brand five years ago? In fact, the same general grille design was used on the last model year of the Dodge Ram pickup. The fact the new grille’s first appearance on a regular production truck came on the top-of-the-line Laramie is an indication that Ram is looking to persuade owners of earlier premium Ram pickups to trade their old truck by making the new truck visibly different. When I was young, grille changes were an annual event, making each new model distinct from those that came before. Automakers don’t do that any more, but a change after six years seems reasonable. The use of the prominent “RAM” on the Rebel’s grille is similar to what Ford has done on the Raptor, which has a big “FORD” on the grille instead of a blue oval. It sets the special truck apart from other models. As for the large RAM on the tailgate, name a pickup brand that hasn’t done this at one time or another. In short, there’s no identity crisis required to explain the change. As far as establishing a brand identity, I would imagine that if you asked most male consumers to complete the phrase “Guts, Glory…”, most would say “Ram.” They might even try to sound like Sam Elliott. That’s successful branding. Worries about losing the classic Ram logo would seem to be unfounded. A look at the interior shows the familiar shield is right in the center of the steering wheel. Considering that it’s much less costly to change a small badge than it is to change a grille and tailgate, one would assume any effort to rebrand would include that change. Consider the ProMaster City. While the big ProMaster was already in production, it would have been easy to change the small van’s grille and badging. Yet the ProMaster City has Ram shield badges front and rear. Now consider at the two brands’ product lines: Ram has pickups, chassis-cabs and commercial vans (ProMaster City is clearly targeted at businesses). Dodge has passenger cars, family minivans and SUVs. The only Dodge fleet vehicles are special purpose, such as the Charger Pursuit and the Durango SSV. There isn’t any overlap, even in the same showroom. It was Chrysler, not Fiat, that originally pushed for a retail network in which as many dealers as possible sold all the Chrysler brands. If anyone is worried that Ram is phasing out the Ram logo, the first question that comes to mind is “Why would they?” The brand name is Ram; what else are they going to use? It’s unlikely that Bob Hegbloom, Sergio Marchionne or Olivier Francois lose much sleep over whether dealers or consumers call the truck a Ram or a Dodge Ram. FCA US and people can call it anything they want as long as it changes hands from the first group to the second group in large quantities, and Ram U.S. sales last year were the best since the all-time record year of 2003 and missed setting a new all-time Graham/Dodge/Ram sales record by just 9,583 sales. In the end, the grille change isn’t a quest for identity or an escape from the shadow of another brand. It is a relatively inexpensive styling change made by a brand that seems comfortable enough in its own skin to try something new. Some Web sages noticed that the only interior color available for the Ram Rebel and Laramie Limited was black (this has been true for both generations of Laramie Limited). With the 2015 Ram 1500 Laramie Limited, even the headliner and pillars are black. We asked Ram lead interior designer whether this was due to customer choice or cost, and he said it was partly a matter of being appropriate to the vehicle. There’s just something about wearing a black suit, just a nice black suit, that your details pop. I think that’s the thing that we’ve learned over the years, that it’s okay to have a very calming black, very consistent, and then accent it with colors. That’s what we’ve chosen for like you mentioned the Limited; we’ve chosen it for the Rebel that we’re sitting in. It’s appropriate. Mr. Nagode also mentioned the dirt resistance (to fingerprints) in truck use, as well as customer choice if presented with different options at a lot. However, he also noted that for other vehicles, different colors were more appropriate, particularly in cars such as Charger, Challenger, and Viper. The Laramie Longhorn, he pointed out, comes in either black with brown seats, or in “a frost color” with a warmer brown. It’s just sometimes the extremes, we tend to kind of limit the choices. Like our Express and Tradesman really only comes in a black environment. And again, that’s perfect for someone that’s going to get it dirty. … At the core of our market, we tend to offer more colors, more variations.